While this is temporary the barriers installed to enable retaining wall repairs on Carlton-Gore Road make a nicely protected cycleway. Who knows if it Wellington’s first, but it is located on an existing bike lane, and provides a good model of what it feels like to be truly separated from car traffic. 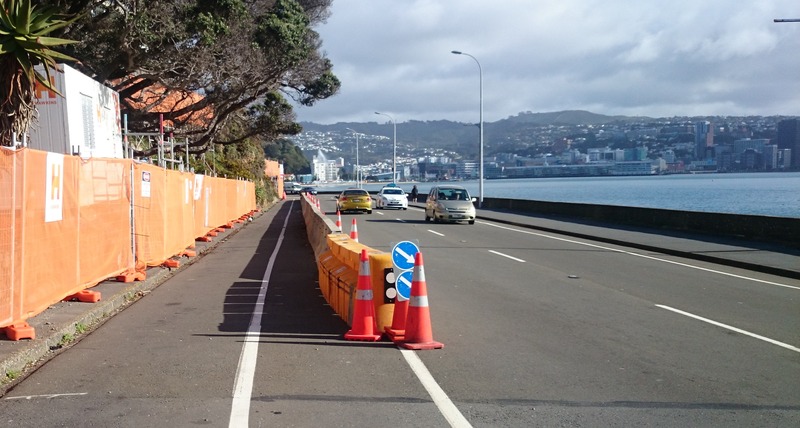 Contractors’ vehicles are parked inside the barriers during work hours, so the weekend is the only time that the barriers can be used as a cycleway. While this is unintentional, the refurbishment of Carlton-Gore Road has created a nicely protected cycleway – for the weekend at least – it’ll be blocked to bikes when the contractors return on Monday. I thought I’d ride inside it as there were no vehicles parked inside it. The feeling of security is greatly increased when behind the barrier. There is little chance of falling over it, or being side-swiped by a car while behind it. It feels much nicer and less stressful – you don’t have to watch your back as much, and the passing cars don’t feel as intimidating. It would be great if something like this, where a barrier that physically separated cars from bikes, was installed to create more separated and protected cyleways – places like narrow and busy streets, and blind, left-hand corners would be great applications. For the moment, this is worth checking out on the weekend, and hopefully we’ll see more permanent cycling infrastructure like this in the future.